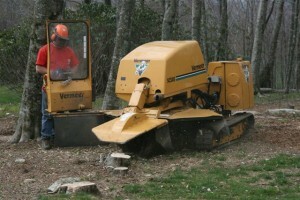 Hunter’s Tree Service, Inc. offers affordable prices on stump grinding throughout the High Country. Stumps may be a nuisance or visually unappealing to a homeowner. If you’ve ever tried to remove a stump yourself, you can attest to how difficult and time consuming it is. It’s just not worth the effort because we can easily and quickly grind down a stump. Our stump grinder is mounted on rubber tracks which does minimal damage to lawns and turf. These tracks also make some hard to reach stumps more accessible. Stump grinding is not a complicated process, but it can take a great deal of work even with the stump grinding equipment that we use. Before we start grinding, we usually remove rock and other debris from around the stump. Sometimes we need to use a chainsaw to trim the stump closer to the ground before we place the stump grinder over the area to be ground. Contact us today if you have unwanted stumps located on your property that you need would like ground down. At Hunter’s Tree Service, Inc. we have the experience needed to handle a job safely and efficiently. In addition to stump grinding, we offer pruning, view enhancement, tree removal, bucket truck service, crane service, lightning protection, tree cabling, pre-construction consultation, and fertilization and pest control. We have equipment for whatever job you need in the High Country. We place a strong emphasis on professionalism and maintaining rigorous standards for customer satisfaction. We welcome the opportunity to help you with your trees!